WHAT he saw changed his life forever. 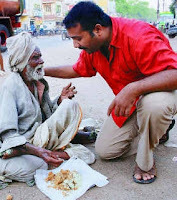 Cycling down the streets of Madurai (Southern India) one afternoon in 2002, Krishnan saw an elderly man. He was destitute and mentally ill but what shocked the young hotel executive, who then worked for a five-star chain in Bangalore (India), was that the man was eating his own waste. "I was benumbed. From a nearby eatery I purchased 10 idlis, washed the man's hand with the drinking water I was carrying and gave him the food, which he polished off in no time. Sleep deserted me that night as the old man's image kept flitting in and out of my mind." Changed life / By the following morning, Krishnan, who was about to leave for a training programme in Switzerland, had decided to walk away from his future. He quit his job and to the dismay of his parents, he spent the next two months cycling around Madurai and distributing food packets that he purchased from his savings to mentally ill destitutes. "I started by using my mother's kitchen", he recalls. Single-handedly cooking three meals a day for 40 people, packaging and distributing them was no easy task. But Krishnan was determined in the face of his parents' worries about his new found "vocation". Krishnan claims that not a single meal has been missed so far. "My family or friends step in if I am ill or away," he says. "If I leave them hungry for a day, they will again return to garbage bins," fears Krishnan whose arrival is awaited by many. [>] read in full about this 'Real' work, which our world in our time needs so much. Surprisingly we say, 'we live in a modern time', but in truth, 'we live in a time of humanity in crisis'. the more work is done for humanity and to restore the dignity of those portion of neglected humanity, the more real work we are gonna have.